Tellus sixth single in the order. This is the first time that it is available as a digital download. Here is a collection of the most popular songs from the 90’s. I wanted to create a mix, as long as possible, to be able to include as many songs as possible in this mix. But to do a mix of 20 minutes would exclude radio-play. Therefor, I created a 20 minutes mix that could also be played as 3 separate mixes. Hence the title “Mix(es)”. This is probably one the mixes that got most played all over, and can still be heard from time to time on dance floors all over Sweden. The Man With Background became Tellus third top 5 on the Swedish Dance Chart. “A real banger”, as they called it up in Stockholm. Remixes from my friends Minello and Tobias Lindell, but also a mix from Stonebridge, JJ and Nick Nice. This is the first time it is available on digital formats. 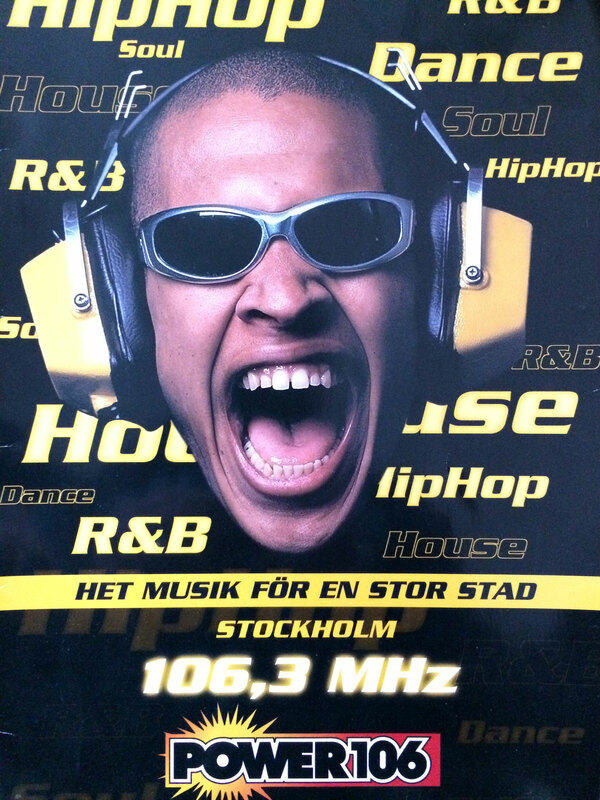 We continue the journey with mixes for brand new Power 106, that was a local Urban and Dance radio based in Stockholm. They wanted 2 mixes of 1 hour each with house music, every month on their show ”Power Hot DJ Mixes”. 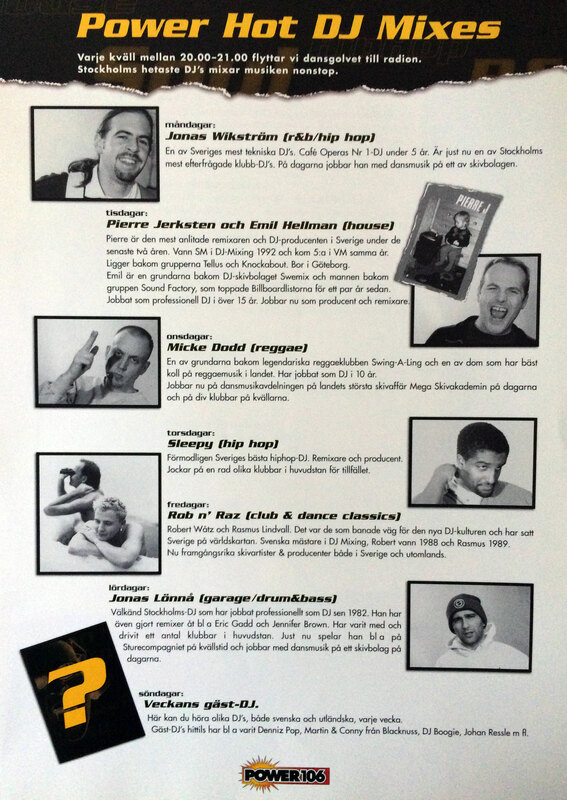 Other known DJs that I shared this show with was Rob’n’Raz, Micke Dodd, Emil Hellman, Jonas Wikström, Jonas Lönnå och Sleepy, all with their special genres. I did 28 shows during one year and here you’ll find some selected shows from 1997. A mixtape in 2 parts that gathers all the popular songs at the time from all different genres. 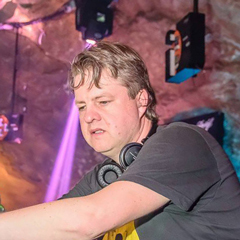 The first part goes from r’n’b and hip-hop to house and the second part goes from house to techno, trance and sums it all up with some drum’n’bass. These mixes was later aired on Swedish National Radio P3 when P3 Mix turned into P3 Remix with Pierre J, during the summer of 1997. With the intention to support a small and new underground label from Sundsvall named Dunkla, all my three singles there went top 20 on the Swedish Dance Chart. They got way more attention than expected even though the music itself was way more underground than everything else on the top 20. A couple of Roland’s TB-303 played a major roll. After the success of the first singel for Michael and Nello, the sequel Good Times arrived. This is the first time it is available on digital formats. Nello’s one-man-show, that helped him with. Apart from Nello’s versions, you’ll also find a remix from Tobias Lindell. He is today very active with his company Lindell Audio, selling high profile studio equipment and plugins, known for its quality all over the world.